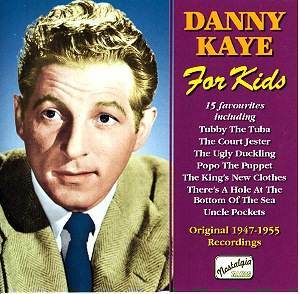 A couple of years back, Naxos issued a wonderful compilation of tracks by the greatest of comedy songsters, Danny Kaye [review]. Yours truly, however, bemoaned the absence of one item in particular – the great, the remarkable, the INCOMPARABLE Tubby the Tuba! Naxos heard my cry, and promised it was on its way. And, would you believe it, here it is on track 4, complete with Signor Pizzicato, Peepo the Piccolo, the baritone bullfrog, and of course poor despised Tubby himself, all brought to life in George Kleinsinger’s delightful musical tale. There are a couple of lesser-known spin-offs too; ‘The Tubby the Tuba Song’, a shortened version of the same tale, and ‘Tubby the Tuba at the Circus’ on track 9. This is a similar length to the original, and though like most spin-offs, it’s not quite as good as its model, DK’s many voices are nonetheless deployed to great effect as usual. The elephant’s song ‘Be Yourself’ is a great number too. There is a clutch of songs from successful films – ‘The Ugly Duckling’ and ‘The King’s New Clothes’ from Hans Christian Andersen, and ‘I’m Late’ and ‘The Walrus and the Carpenter’ from (I believe, though I would welcome corroboration) Walt Disney’s Alice in Wonderland. Many of the tracks, though, are just straightforward silly children’s songs, several written for him by his wife Sylvia Fine. These include the tongue-twisting ‘There’s a hole at the bottom of the sea’ on track 1 (strongly recommended to all primary school teachers! ), Popo the Puppet, and the final track, another extended musical fable, ‘The Court Jester’, with its brave hero The Fox, and the Terrible, Dreadful, Horrible King. It also has a meltingly beautiful little lullaby ‘Behind the Rainbow’. Then there are other favourites such as ‘The Little White Duck’ and ‘All I want for Christmas is my two front teeth’. I can guarantee these nostalgic but evergreen songs will banish those winter blues in the most effortless and entertaining way possible – treat yourself!